I’m a lover of all things cloth. There is just something so luxurious about using cloth napkins and cloth paper towels. We also love cloth diapers. There’s just something about using the “real thing” as opposed to something made to be thrown away. I also can’t stand the thought of buying something specifically to throw it away. I can honestly say that since I left home at almost 19 years old, I have only purchased paper plates, cups, napkins, or paper towels a handful of times. It’s just so easy to wash cloth napkins or real plates, even without a dishwasher. The cost of disposable is just not worth it to me. If you love cloth like I do, or you want to start a cloth collection, why not start with some easy-to-sew cloth paper towels. I love these towels because they are the perfect size for wiping up messes and little faces and hands. I can wipe up a spill and toss it in the washer with the rest of my laundry and not feel guilty about it. These towels are incredibly simple and would be a great starter project if you are just learning to sew. The best thing about the project is that it’s OKAY if they’re not perfect, they’re just for wiping up messes. I whip these up fast, usually with my little helper in my lap, so sometimes my seams are not perfect. I’m okay with that. So what do you need for this project? You really only need two things (other than a sewing machine and the basics like scissors), at least one yard of flannel fabric and coordinating thread. Check out the remnant bin at your local fabric store. I can usually find full yards of flannel (if you’re not picky about the pattern) for only a few dollars. Remember, the remnants are already 50% off, but they might already be on sale. I regularly find fabrics that are on sale 50% off, then I get an additional 50% off because it’s a remnant. Score! To start, lay out your fabric and decide how big you want your towels. My towels are approximately 10″ squares finished, so I cut 11″ squares out of my fabric. You will need a front and a back, so just continue cutting squares in even numbers until you run out of fabric. You can cut them to any size you would like. Feel free to use a quilter’s square if you have one. I used a square cookbook I had from the library, then just used the previous square to cut the next. You will notice that my sewing pins look a little fishy. Yes, they are Ava’s hair clips. For some reason, my sewing pins were MIA so I had to improvise. These flat hair clips actually work great if you are in a bind. Use what you’ve got, right? Once you have all of your squares cut, pin (or hair clip in my case) two pieces, right sides together. If your fabric has a pattern like mine does, you will want to make sure that everything is running the same direction. Begin sewing on the lower third part of one side. Remember to back-stitch at the beginning and end. Continue sewing around the entire square. When you get back to the side where you began, sew the top 1/3 of the side and back stitch. This will leave you with a hole a few inches long. This is how you will flip your work. Flip your work right side out. Use a pen or a seam ripper to poke out your corners. You will end up with three finished sides and your opening on one end. Tuck your open end in and pin (or clip). Beginning in one corner, sew around the entire towel approximately 1/4″ from the edge. This will close up your opening and create a finished look for the entire towel. You could even get fancy with some decorative stitching! Your first towel is finished! Once you get in a groove, these will sew up really fast. I have a set of 12 and will probably sew up another set if when I find another print I love. I’m sorry if you are seeing this twice this morning. We are having some technical issues with our photos. Hopefully they are resolved now. 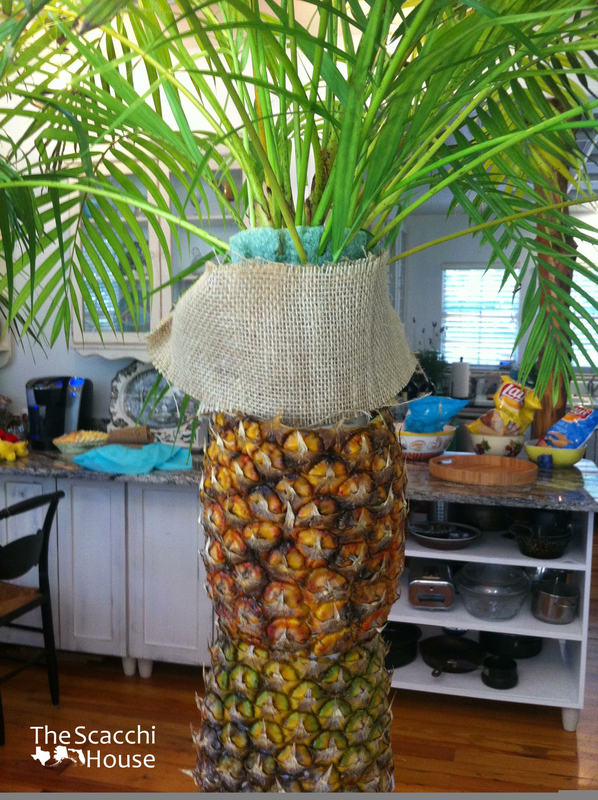 Are you curious how I made the pineapple palm trees I talked about here? Although they were a bit challenging at first, they were fun and exciting to build. Here’s another look. Do yourself a favor and pick the right pineapples. Your pineapples should not be green when you cut them. The best way to pick a pineapple is to smell it. It should smell sweet and delicious. If your store only has green pineapples, buy them a few days before you want to cut them. They will most likely be perfectly ripe by the time you are ready to cut them. To get the pineapples to slide over your PVC pipe, you need to hollow them out. 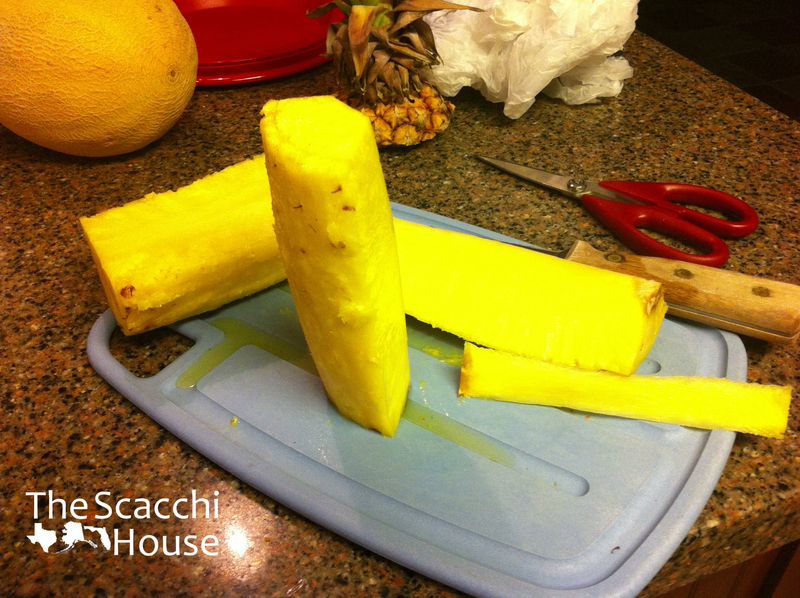 On a cutting board (preferably one that will catch the extra juice), slide a very long sharp knife down along the skin of the pineapple. It should glide very easily along the skin. You only want to cut about half way down. Take your time. 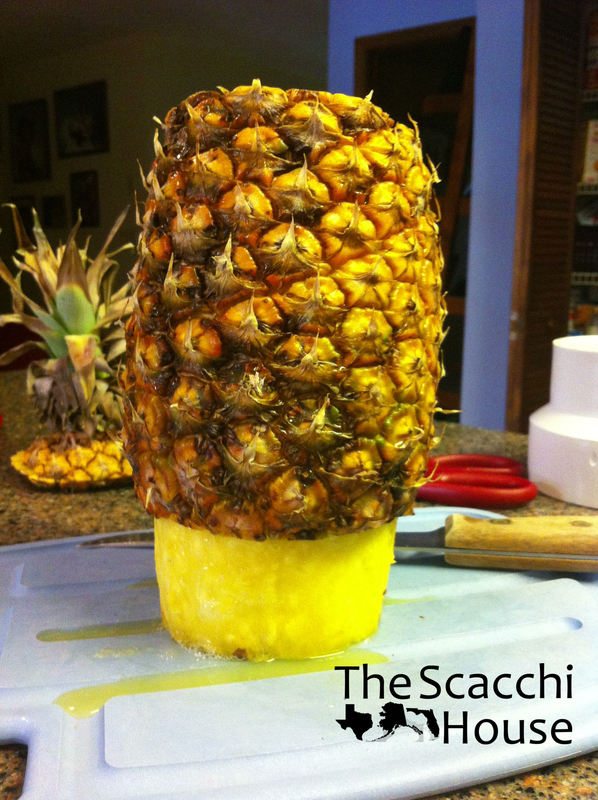 After you have made it all the way around, turn the pineapple upside down and cut along the skin once again. Once you have made it all the way around you may need to gently slide your knife along your cut to loosen up any flesh that’s still attached in the middle. The solid chunk of flesh should slide right out of the pineapple skin. You will be left with two pieces: The solid skin ring and the chunk of juicy delicious flesh. If you are not building your palm trees the same day, you will need to store your pineapple skins. I simply wrapped mine in a plastic grocery bag and tucked the excess bag in the top of the pineapple skin. I then stashed them in the refrigerator. I cut mine two days in advance. I don’t recommend cutting them any earlier than that. 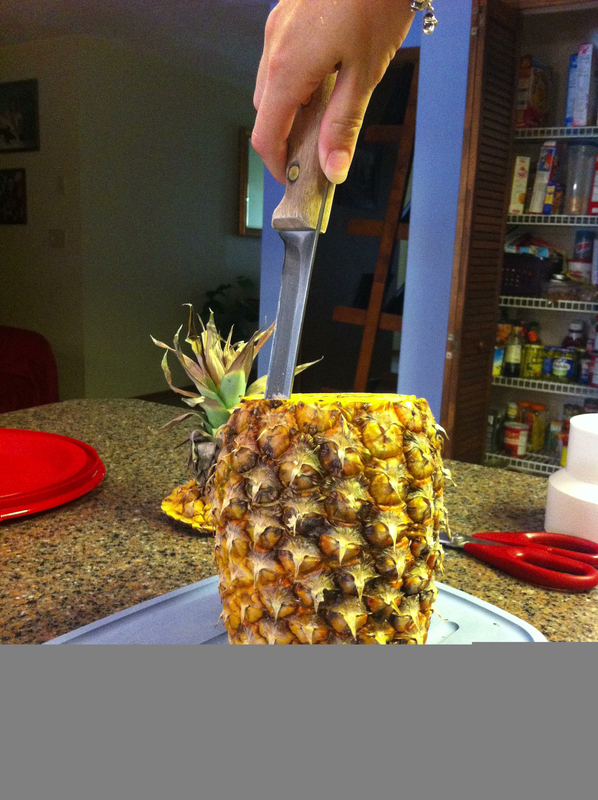 You will then want to cut up the pineapple flesh. I cut mine into equal quarters. To remove the core, run your knife down the inside corner of each quarter. This will give you little wedges with the tips cut off. You can then slice the quarters into wedges or chunks. 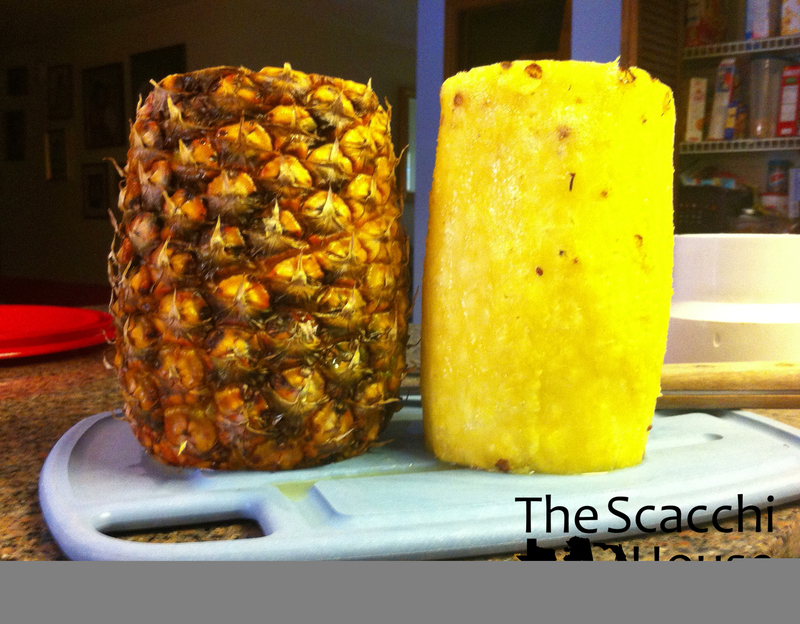 Store your cut up pineapple in airtight containers or bags until you are ready to serve. My little helper woke up from her nap half way through. Gotta love the hair! You will need to build a PVC stand for your trees. We bought a 10 foot length of 3 1/2 inch PVC pipe. We really only needed 5 feet of pipe but the 10 foot pipe was almost $1.00 less, go figure. We were able to easily cut the PVC down to size with a simple hack saw. You can see at the bottom that we purchased an adapter piece that sizes it up. This allowed us to use the cap that Lowe’s had available. The adapter also created a nice little base for the trees. My mom and I both agreed that if we used them again, we would definitely paint them brown. The white becomes troublesome to hide. More on that in a bit. To assemble the trees, simply slide the pineapple skins down over the pipe. The bottom pineapple should sit right on top of the adapter piece. To cover the white PVC bases of your trees, creatively wrap kale around the base. We also got creative and added some flowers to the mix. 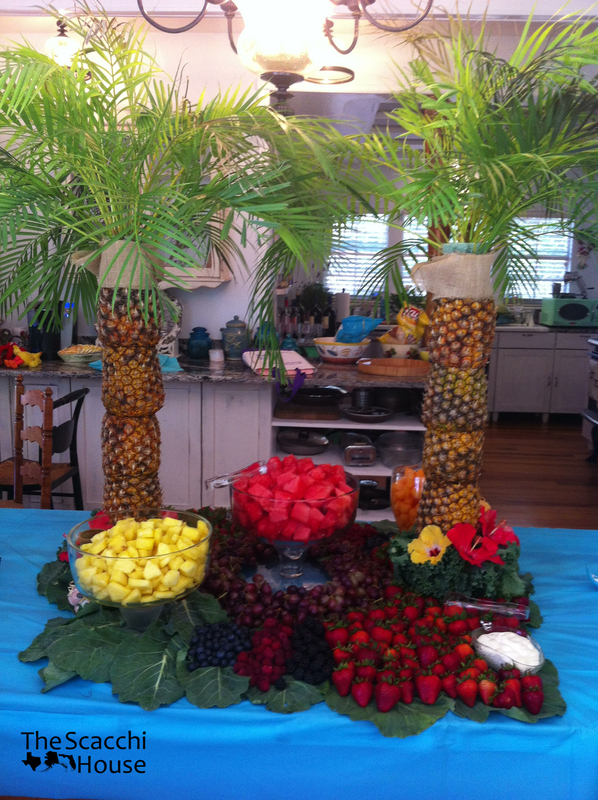 We also used collard greens as a base for our fruit display. 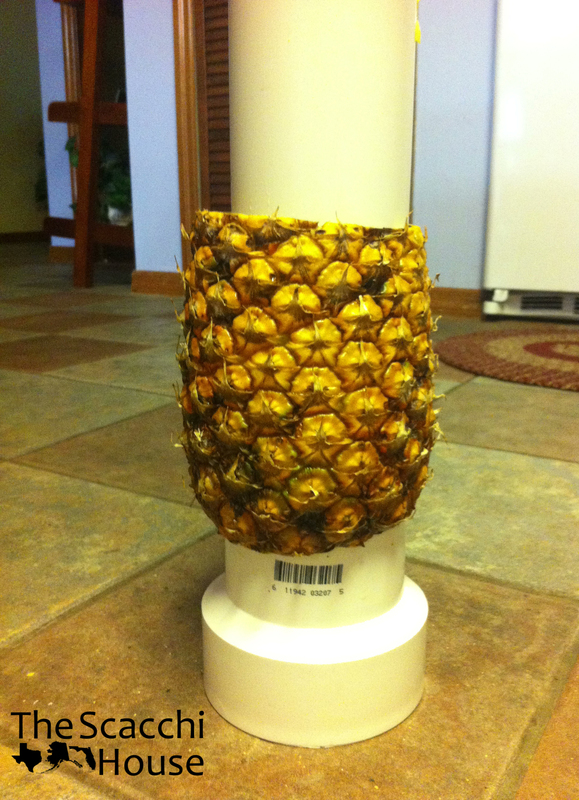 Once you thread on all of your pineapples you may or may not have some PVC pipe left exposed. If you have your hack saw handy, feel free to shorten it up. We were fresh out of hack saws at the wedding location. We improvised by wrapping the remaining pipe with burlap, which worked really well. Fill your PVC pipe with your heavy material. We used solar salt (evaporated sea water) that is normally used in a water softener. We wanted to use something safe around the food. After the wedding, we used the salt for a sensory bin for Ava. Double win! Cap your pipe off with the floral foam rounds. We found these at the Dollar Store. We held up the burlap with a few toothpicks in the foam. Top of your tree with lots of fresh palm fronds. My Uncle Cris graciously picked these for us from his yard in the dark. Thanks Uncle Cris! You’re finished! Your trees are done and you can finish decorating the rest of your table scape. Do you have any pineapple tree plans? I mentioned that I got 5 FREE cloth diapers when I talked about cloth diaper basics. I got the diapers on Freecycle. If you don’t know anything about Freecycle, it is a community where people give things away so they stay out of the landfill. It is a really great concept and there are individual communities in most cities. I have been Freecycling since 2007. I have received (and given away) tons of really awesome stuff, everything from a sofa, to cross-country skis, to these 5 bumGenius cloth diapers. The woman who offered these diapers up did say that they needed a bit of work, but for free, I was willing to accept the challenge. Turns out that they really only needed new hook and loop (Velcro). 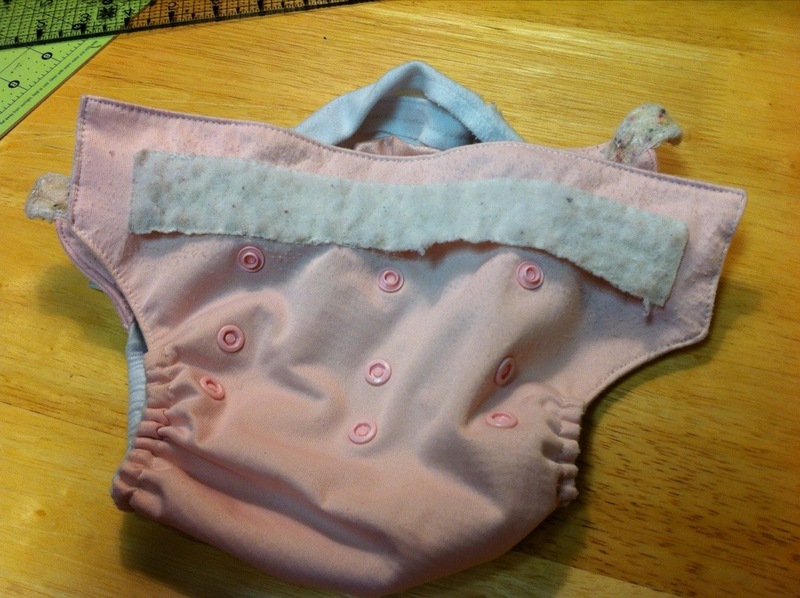 After many washes, the hook and loop on cloth diapers can wear out and eventually, no longer stick. After doing some research, I found out that bumGenius sells refresher kits for $1 each. All it said was that it would include the hook and loop and new elastic. The elastic in my diapers was perfectly fine, so I only needed to replace the hook and loop. You can see how worn the hook and loop is. The first step is to carefully take a seam ripper and remove both wash tabs from the back of the diaper and both sides of the closure tabs. Take your time! You do not want to rip the waterproof fabric (the pink fabric on my diapers). I worked on this whenever I had a bit of free time. You could probably take all the old hook and loop off one diaper in about an hour. This is what your diaper will look like after you remove all of the old hook and loop. Remember, you WILL NOT remove the Velcro that runs along the front of your diaper. Your new hook and loop will stick to this old piece just fine. The front piece of Velcro was coming off of one of my diapers along the bottom. I decided it was best to hand stitch this back on. Once I stitched it back on, it held perfectly! 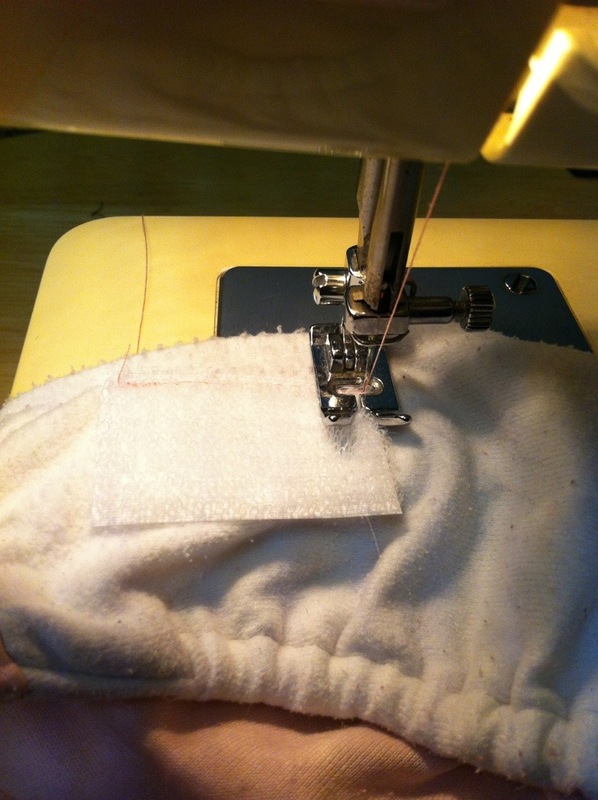 To sew your new hook and loop on, I recommend using a sewing machine. You could hand sew it on if you do not have access to a machine, but the machine will result in less swear words. =) For the wash tabs, just place them over the spot where the old one was. I stitched around the outside and once across on a diagonal for extra support. Somehow I didn’t manage to get a picture of sewing the tabs. Basically, you want to create a sandwich with hook part on the inside and the loop part on the outside. The elastic tab of your diaper will be the middle of your sandwich, just use the holes from the old tabs as your guide. Sew around the outside of your sandwich. Once you have your new tabs on, take it for a test drive. Good as new! These diapers cost me $1.47. Definitely a bargain! Have you had to repair any cloth diapers? Have you ever used Freecycle? A lot has happened here at The Scacchi House in 2012. The blog was born and then we became self-hosted. Here is a list of interesting facts from 2012. We had 2,100 views in 2012. That’s not a lot in comparison with some other blogs, but it means we’re growing! The busiest day here on the blog was the day I posted this picture. It also happens to be our first day here in Alaska! 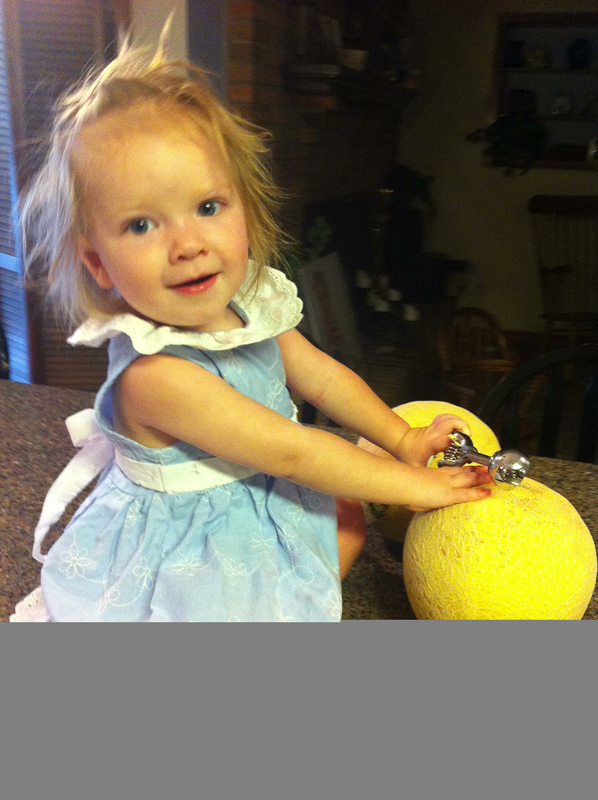 Our most popular post from 2012 was Ava’s DIY Headband Holder. It still continues to get daily traffic. Most of our readers come from the USA, with Canada and Sweden almost tied for second. So tell me a bit about yourself. Who are you? What keeps bringing you back to The Scacchi House? What would you like to see more of? And most of all, thanks for reading and supporting us! I suckered Tony into going to The Salvation Army thrift store this week. The key to that was making him think the trip was for him. He does need more work pants, so I told him we should look there. I just like to see what kind of treasures I can find. The first treasure I found, but I didn’t get a picture of, is one of those Fisher Price stacking ring baby toys. Ava doesn’t have one and for 50 cents, she had to have it. Happy Birthday Ava! 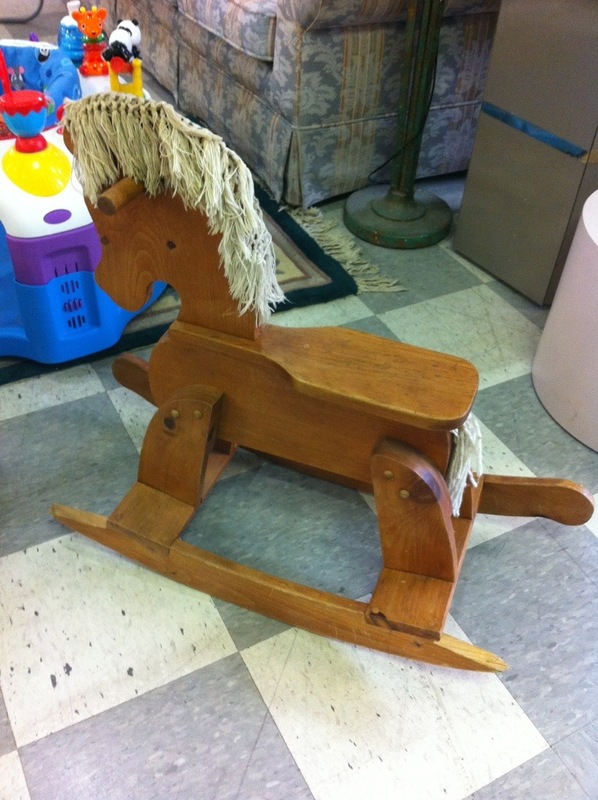 The next thing I found was this awesome rocking horse. I was all about buying it, as was Ava, until I realized one of its rockers was broken. So now it was a project… and it didn’t have a price. So I found someone who worked there and found out it was $7.50. After thinking about it, I decided that my threshold was $5.00, and they weren’t moving. Boo. That is a 1934 Wurlitzer studio piano. Now, I’m no Elton John, but I have high hopes for Ava. I can’t lie, I can only play one song on the piano… and it’s from a beginner piano book. Fail. Tony on the other hand can play. He carries all the musical talent in the family. So hopefully Ava will pick up piano, drums, saxophone, or some other random assortment of instruments that Daddy plays. I was in love. It did need some restorations, but it was in good condition and had tons of character. It could be all ours for the price of $200. Don’t worry, we didn’t come home with a piano. 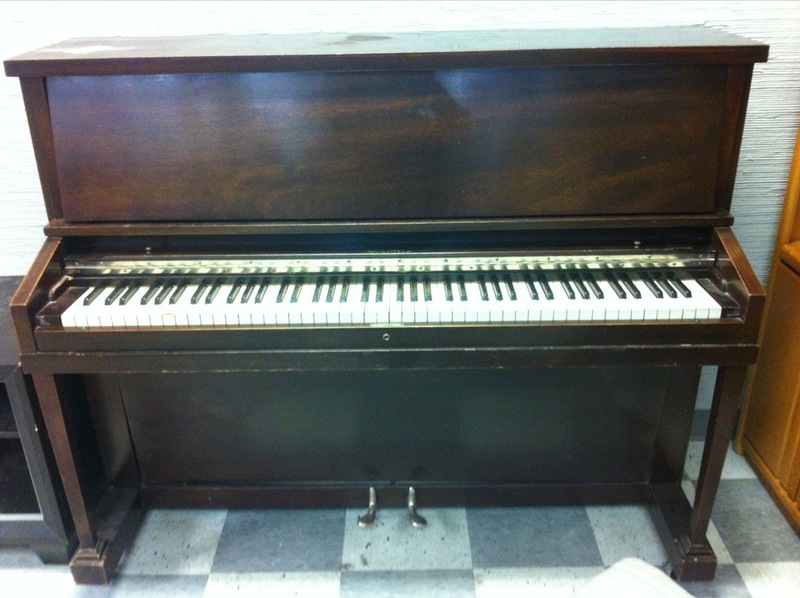 We don’t have room for it right now, but as soon as we buy a house, the piano hunt begins again. So we parted ways, leaving The Salvation Army spending only $2.00, all on Ava (big shock). Have you found any good finds lately? Ava’s new favorite thing to do is empty everything out of my wallet. Since moving to Alaska, I have stopped carrying a purse, I just put my wallet in her diaper bag. This puts my wallet right at her fingertips most of the time. It’s not good when we are out somewhere and I look down, only to find the contents of my wallet littered across the floor. That’s the fastest way to a stolen debit card. You noticed here that I picked up a wallet at The Salvation Army thrift store for 50 cents. 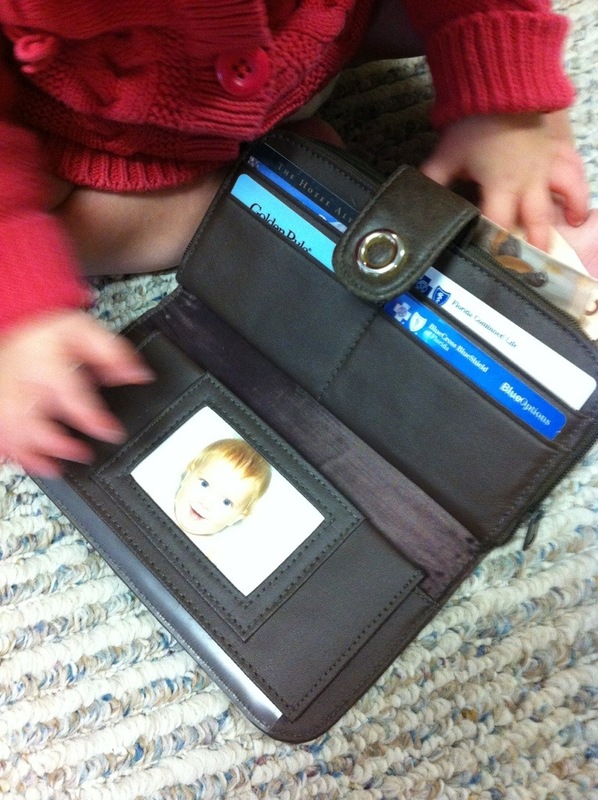 Why can’t Ava have her own wallet, with her own stuff to lose? The wallet I found is made from soft brown leather and has places for cards, a driver’s license, coins, and a checkbook. I brought it home and cleaned it up a bit. Tony and I then cleaned out our wallets. I had some old insurance cards and random business cards. Tony had a room key from a hotel and two Canadian $2 bills that his grandfather gave him when he was a kid. He donated these to Ava’s wallet. (Please note that Ava has never put paper money in her mouth. I’m not sure why, but she doesn’t. Watch your child to see if they put money in their mouth, or use fake money.) I wanted her to have some coins for the zippered coin purse compartment, but putting actual coins in it would be a choking hazard. We’re not trying to entice trips to the emergency room. I found two plastic coins that go with Ava’s toy piggy bank. They fit perfectly. The last compartment that was empty was the space for her driver’s license. I thought for a minute and then remembered that I had a few extra copies of her passport photo that the guy at the post office gave me. I dug them out and cut one the exact size of my driver’s license. Perfect fit! Don’t you just love her passport photo? She’s all set to go. The only thing missing is a check book. I’m still thinking about that one. 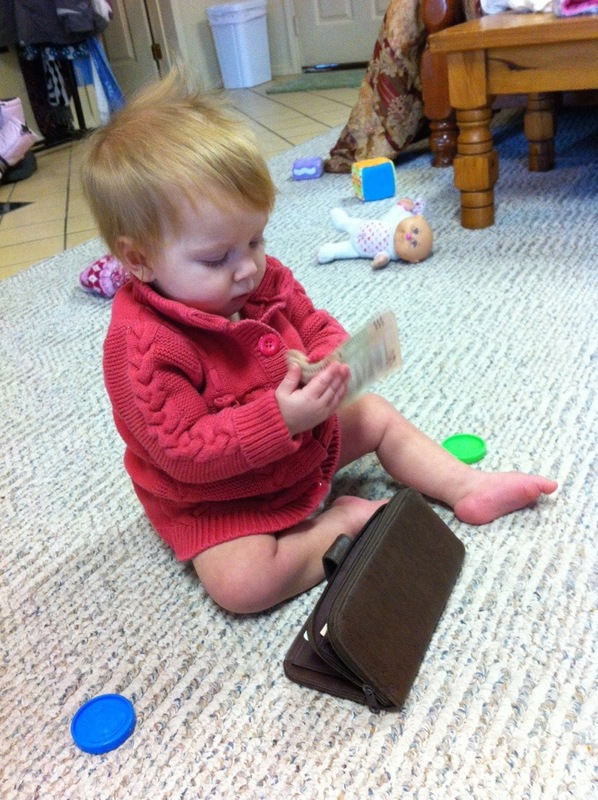 She loves playing with her new wallet. She can pull everything out of it without Mommy worrying about things getting lost. 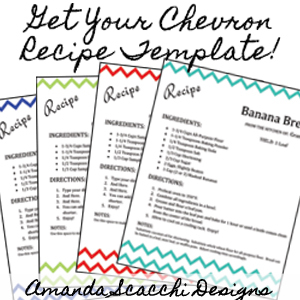 Do you have any ideas for the checkbook? I found a project even easier than the diaper pail liner. Ava’s new favorite thing to do it toss her food over the edge of her high chair when she is finished/bored/mad or really anytime she feels like it. If you could only see the mess on the carpet. The edges don’t fray, so this could be a “no-sew” project! I went to Joann and found the oilcloth. The Joann closest to the house is very small, so their selection is limited. There is a larger, “full-size” Joann here in Anchorage, but it’s all the way across town. Another day. It turned out that my choices were: brown owl print, old granny floral, or this cute circle pattern on a brown background. It was $17.99/yard… ouch! I knew I didn’t need a whole yard, and I had a coupon. 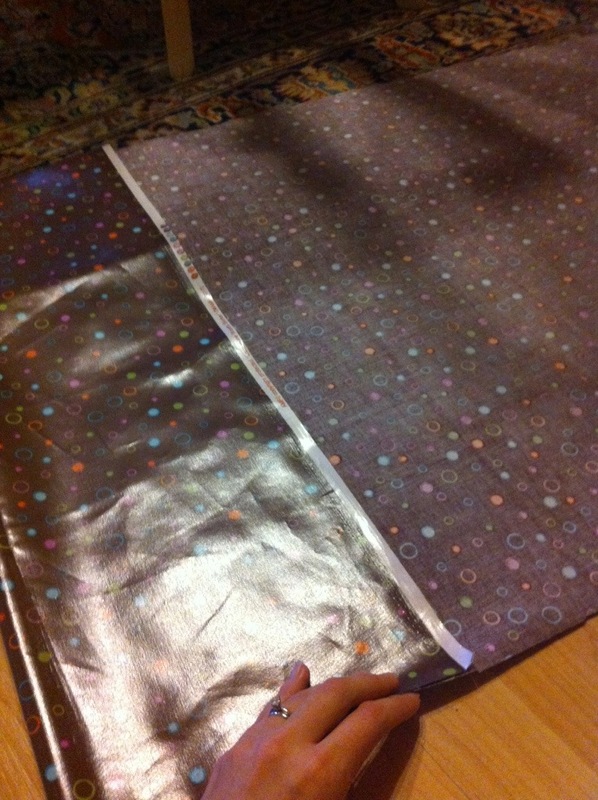 My oilcloth is 54″ wide (on the big rolls next to the home decor fabrics) and I had her cut me 2/3 of a yard. This was the perfect amount and would actually leave me a little extra that I would trim from the edge. 2/3 of a yard @ $17.99 = $12.00 – 50% coupon = $6.00. That’s much more my style. 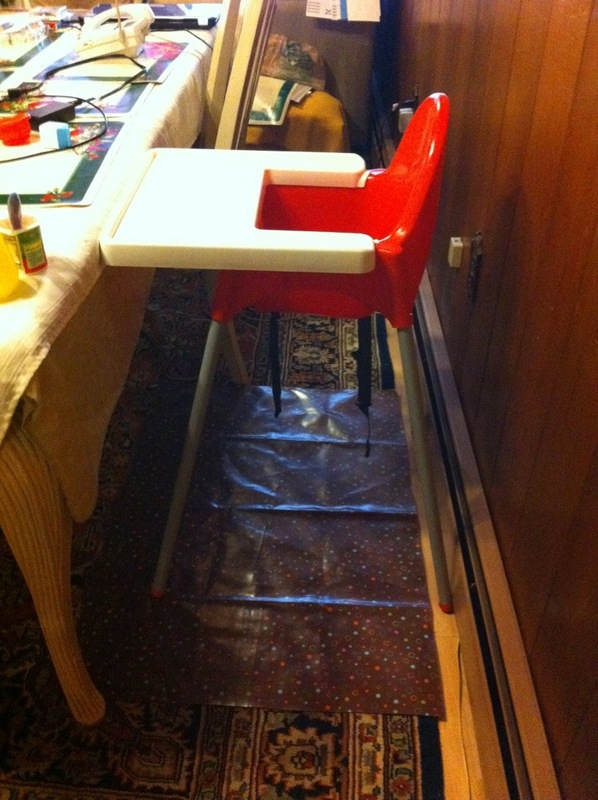 At home, I placed the fabric on the floor where her high chair normally sits to get a feel for the size. Just as I thought, it was too long. Easily fixed! I took my scissors (my new “fabric only” scissors) and made a little notch in the oilcloth where I wanted to make the cut. I then pulled the fabric into a more workable area of the room. I turned the fabric upside down to make the cut. I didn’t have a straight edge, so I folded over the clean edge from the manufacturer that I was going to be cutting off and used it as a guide. Once cut, I then placed it back under the table where its new home would be. Perfect fit! That’s it, you’re finished! It took me about 10 minutes to complete the project and it only cost $6.00 for the fabric. It’s probably more like $5.00 if you discount the scrap. I actually have a decent size scrap left over. I will definitely be saving this for another project. Don’t you love no-sew projects! Enjoy! Ava and I were delighted to meet Ana White today at the Barnes and Noble here in Anchorage. If you don’t know who Ana is, you should check out her blog. Her site is filled with plans to build your own furniture and things for your home. To top it off, they are FREE! You can find her at http://ana-white.com. I have built a few things using her plans. My sister Susie and I built a bench that Tony and I used as our guest book at our wedding. My mom and I built one of Ana’s table bases to go with a table top that we got for free at a garage sale. There are so many of her plans that I want to build. Ana also lives in Alaska, so it was nice that she made two stops in our state on her book tour. 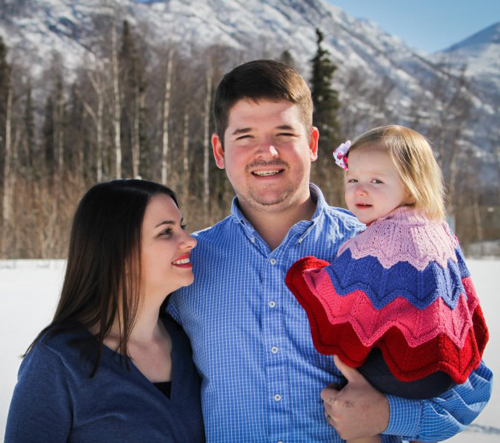 She went to Fairbanks and Anchorage, where Ava and I met her. She was extremely nice! It was really great to meet her. She talked briefly about her book and then answered questions. I asked her about being your own contractor here in Alaska, since her family is currently working on the Momplex. Tony and I are thinking about building a small cottage here, so I was curious. I was pleased to hear that Alaska is a very DIY friendly state. 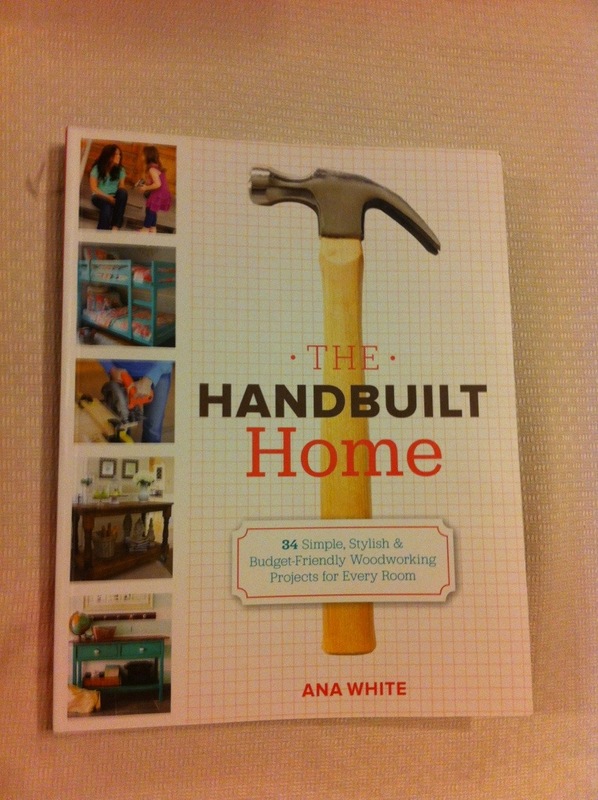 Ava and I then waited in line to have her sign our copy of her book, The Handbuilt Home. We even got a picture with her (Ava was more interest in Ana than having her picture taken). It’s really great to meet other moms doing what they love. If your interested in her book, you can check it out here! Have you built any of Ana’s plans? We have used cloth diapers on Ava since she was about 3 months old. I love it and avoid using disposable diapers as much as possible. We did use a pack of disposable diapers while we traveled from Florida to Alaska for convenience. We have been here for 2 weeks and she has been back in cloth for the past week. As much as Tony says he hates cloth diapers, I caught him telling a guy at the bank all about them when he asked if we used cloth. Who can argue with the savings? In Florida, we never had a diaper pail. We used our washing machine as our diaper pail. Here in Alaska, that’s not really a possibility. So, I decided that we needed a diaper pail. I went to Lowe’s to find a trashcan with a lid since I had a gift card. Of course, the only one they didn’t have was the size I wanted. So I drove across town to the other Lowe’s. Woo hoo! They had the one I was looking for. It’s a 7.5 gallon trashcan with a pop open lid from Hefty. It was $9.97 (no sales tax in Alaska, yay! ), which is a little more than I wanted to spend, but whatever. I will get over it. Next I needed a liner for it. I looked on Amazon since I had recently ordered a new wet bag for the diaper bag. I have always used a grocery bag for a wet bag, but I decided it was time for the real deal. I ordered the Thirsties Deluxe Diaper Duffle from Amazon and paid for it with my Mechanical Turk earnings. And to sweeten the deal, I’m still in my trial period of Amazon Prime. Yay for free shipping! Tony picked it up from the Post Office today on his way to work. So I looked for a pail liner on Amazon and wasn’t in love with the $15-$30 price tag. How hard could it really be to make my own? Not hard at all! I found this tutorial over at The Cloth Diaper Whisperer. Seemed simple enough. Some of her instructions were a little unclear to me, so I just figured it out as I went along. I bought 23″ of white PUL at Joann Fabrics at $12.99/yard. It came to $4.15 after my 50% off coupon. 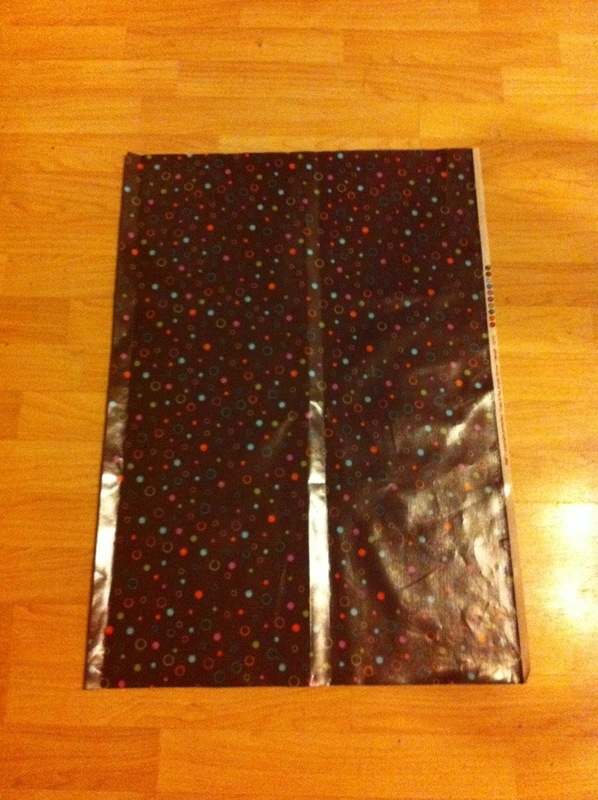 My PUL was 64″ wide and looking back, I could have made 2 liners for the size trashcan I bought. Lessons learned, right? 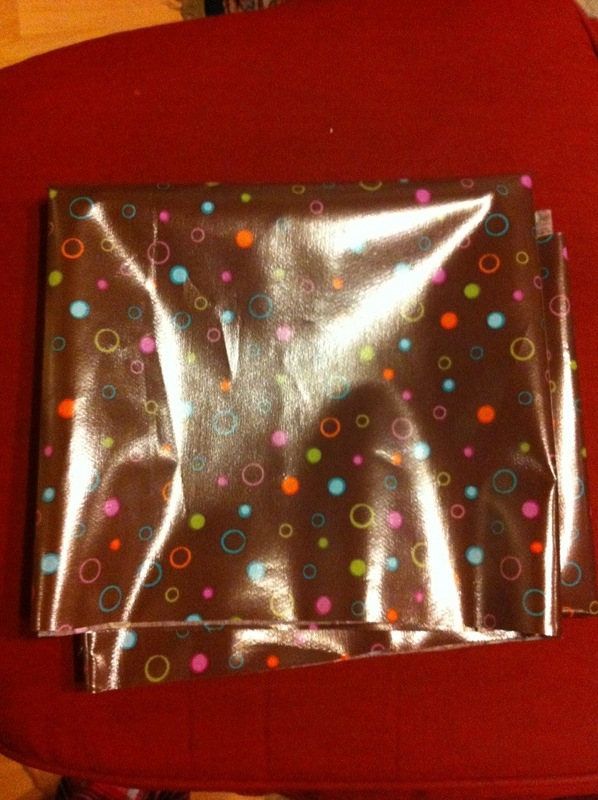 I also bought 26″ of 1″ wide elastic at $2.39/yard. I had a second 50% off coupon, so it was only $1.73 for the elastic. I already had thread, so no need to buy more. The entire liner cost only $5.88! Now, you are probably wondering if I packed my sewing machine in my suitcase. As much as I wanted to, the answer is no. Oma (our adopted Grandmother here in Alaska) has a very nice sewing machine that Opa bought her for Christmas last year. The funny thing is, Oma doesn’t know how to sew. So, she let me borrow her machine as long as I would show her how to use it, which I was more than happy to do. Please keep in mind, I am no master seamstress. The actual sewing of the bag didn’t take that long. I finished it in about an hour, which included stopping to fix my stitching every time Ava decided she would press the pedal for me, which was often. I made one straight stitch along the side, about 1/2″ in from the edge. Then, I did a zigzag stitch right next to it on the outside. This will make the stitch stronger. 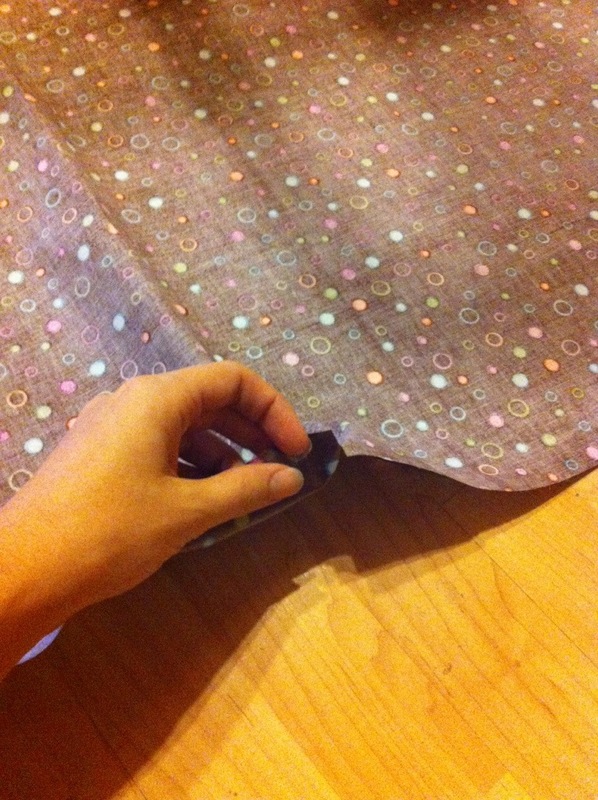 I then cut off the excess fabric on the edge and it looks like this. Ignore my crooked cut. 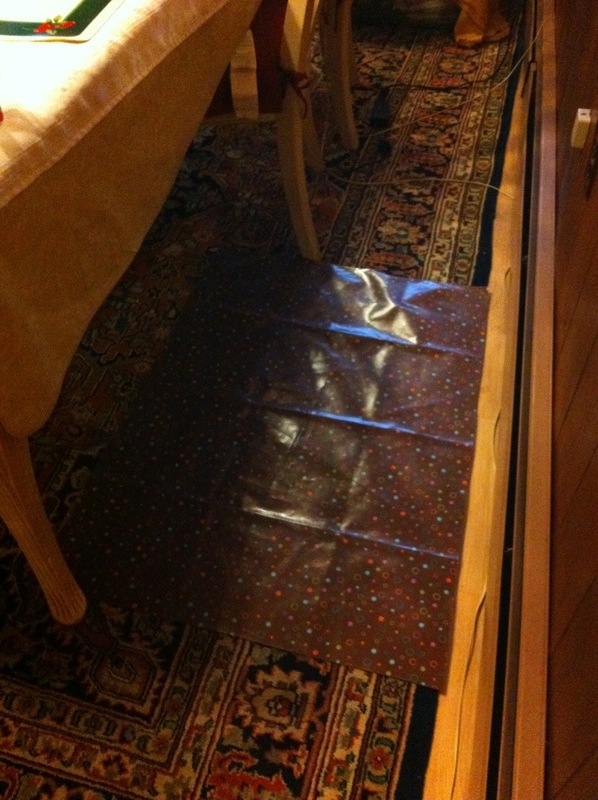 I sewed my seams with the shiny waterproof side facing out. If I were to do it again, I would sew it the other way. You will see why when it’s finished. I then did the same thing on the other side. I sewed the elastic around the top about 1″ from the top. This was no scientific measurement, I just guessed. This was my first time sewing with elastic. Oma was worried that I didn’t buy enough. The key to sewing elastic is to pull it as you sew. This is what it looks like after the elastic is sewn in. At this point you are finished! 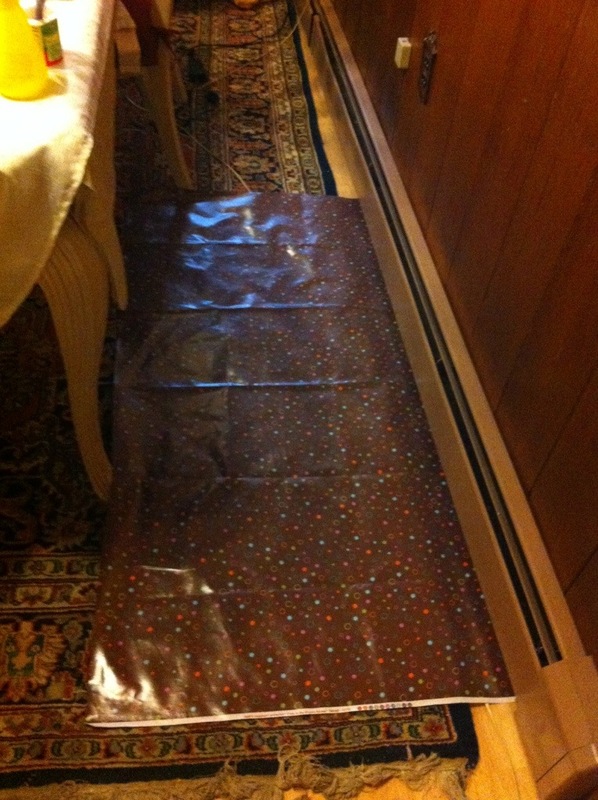 The shiny waterproof side of the fabric goes on the inside of the bag. See the seam showing now, this is why I would do it the opposite was next time. It really doesn’t matter. It’s just a bag for soiled diapers. My bag is larger than my trashcan, which is why I could have made two. It will fit a standard 13 gallon kitchen trashcan. When I put the liner on, I folded the elastic edge under to give it a finished look. 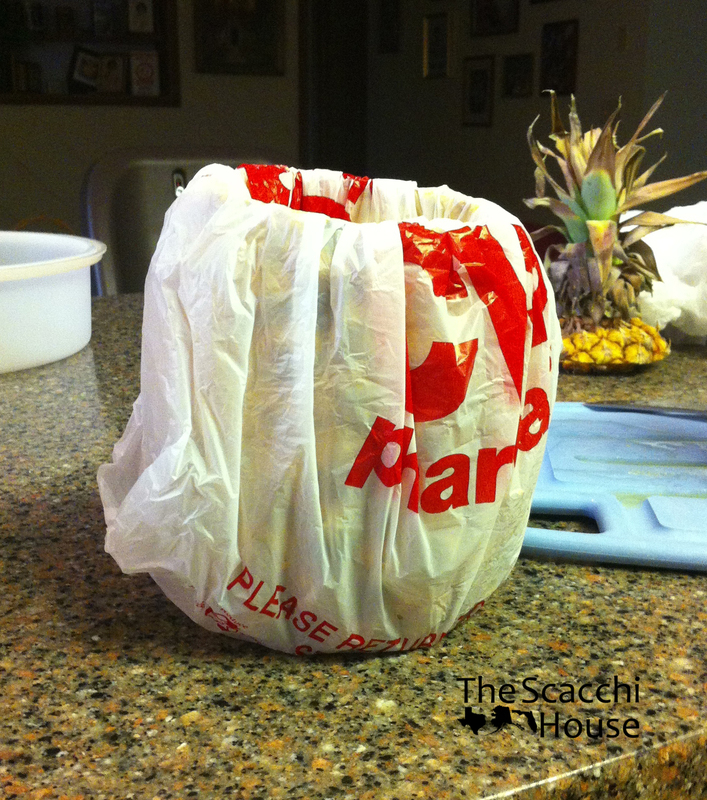 This bag was a very simple project and much less expensive than buying one. Have you ever attempted a new sewing project that was easier than expected? I found an old Tylenol bottle. Store brand Tylenol, to be exact. I washed it out and removed the label. I don’t want to get any crazy looks from people thinking I gave my daughter Tylenol to play with. This was done easy enough with just soap and water. I also removed the cardboard insert that was in the lid. This will allow for the maximum amount of noise. I then filled the bottle half way with uncooked rice. The rice will make a soft shaking sound and is not dangerous if she actually got the bottle open. It would also be neat to use a few different bottles and fill them with different amounts of rice, or even a few with dried beans. This would create different sounds for baby to experience. I put the cap on the rice. You could also use a little super glue if you are worried about baby removing the cap. My bottle has a childproof cap, so it shouldn’t be an issue. Since I am short on craft supplies, I wrote Ava’s name on it with a permanent marker. I also added some hearts for good measure. That’s it! It took me about 10 minutes total and it was free. Most of the best toys are free. It was a hit with Ava. Have you ever made toys from things around the house?